I have never purchased anything at Holt Renfrew. In fact I've never dared to enter the store for fear that the staff will know my entire ensemble is worth less than the Burberry scarf they are selling. As my two girlfriends and I walked through the shoe department on the way to the cafe I passed stunning $650 Manolo Blahniks and wondered when Le Chateau was going to sell a knock off. We were promptly seated and our waiter Marlon (like Brando as he explains), quickly delivered a menu and shared the lunch specials. The lunch menu is a bit more than I'd like to pay for cafe food but it's not outrageous and certainly worth exploring. Before we order I have already decided that Marlon somehow makes the pricey tag worthwhile. One of the most opinionated waiters I've ever experienced, I trust him immensely after he confides that I should not get the choice of Tartine (toasted, open faced sandwich) I was contemplating. I'm sure he looked at my $5 Old Navy flip flops and knew that if I was spending $30 on lunch, it better be good. We started with the Poilane Bread Toasts ($8, picture above), with green pea hummus, olive tapenade, bruschetta and olive oil with balsamic vinegar. The spreads were well balanced with a fresh hummus, briny tapenade and olive oil/balsamic combination that was delightfully sweet with a surprising marshmallow flavour. The bruschetta was average, but then again, it always is. The star of the bread toasts, and foundation of the entire menu, was the Poilane bread. The bread is flown in fresh from the Poilane bakery in Paris three times a week. The thick crusted whole wheat sour dough is dense and wonderfully chewy. However, I'm at unease with the carbon emission nightmare resulting from this excessive decadence. In a city where you can get everything, including amazing artisanal bread, does anything really need to be express couriered from Paris? The Seared Ahi Tuna Fillet Tartine ($18), recommended by Marlon, did not disappoint. 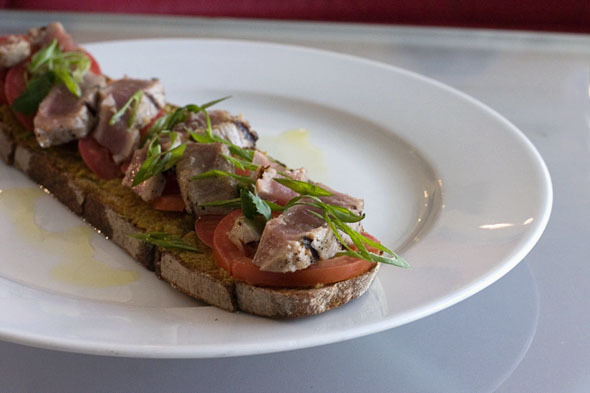 The luxuriant ahi tuna complemented the green olive and ginger root tapenade atop the Poilane bread. 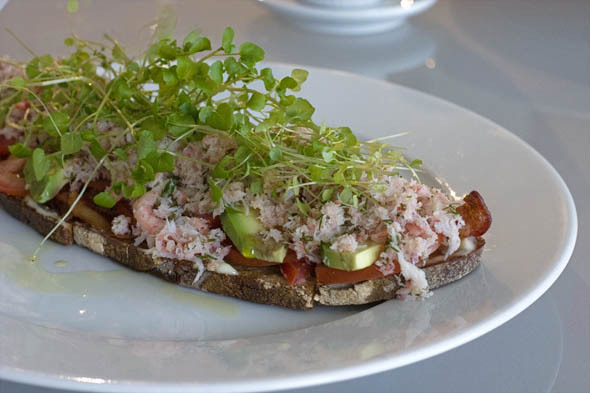 The Crab BLT Tartine ($18) was also a great choice as the bacon was well paired with tarragon mayo, buttery avocado and a surprising, yet delicious addition of shredded coconut. 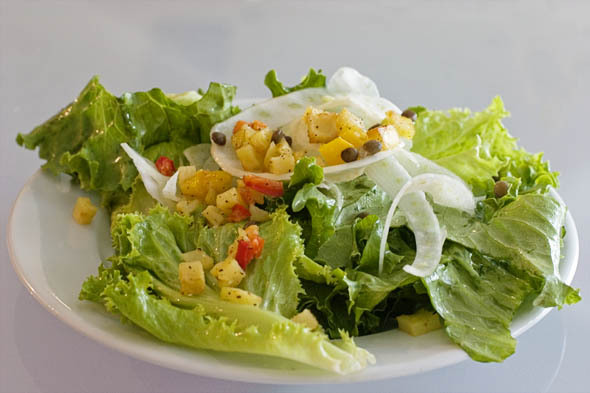 There was ample attention paid to the salads that accompanied the tartines with a light Dijon vinaigrette dressing fresh greens and potato croutons. Marlon also suggested the Lemongrass Chicken Salad ($17) which must be a house favourite. 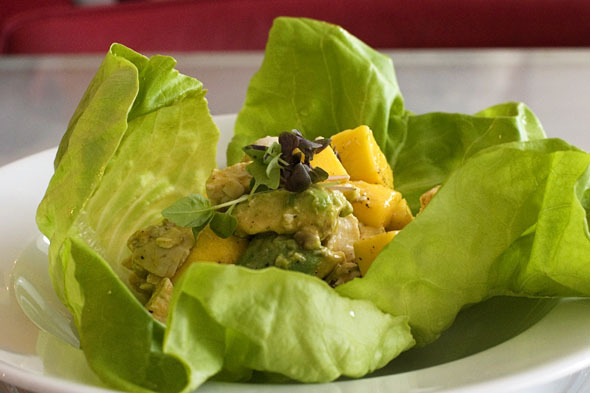 The buttery bibb lettuce bowl housed hearty pieces of tender chicken, avocado and perfectly ripened mango in a subtle citrus ginger dressing. Although pricey, Holt's Cafe delivers with quality ingredients and balanced flavours sublimely constructed. For those that can afford $30 lunches, it's worth a peek as long as you can bear the guilt of eating the bread. Holt's Cafe is open Sunday noon-6, Monday to Wednesday 10-6, Thursday and Friday 10-8 and Saturday 10-6.